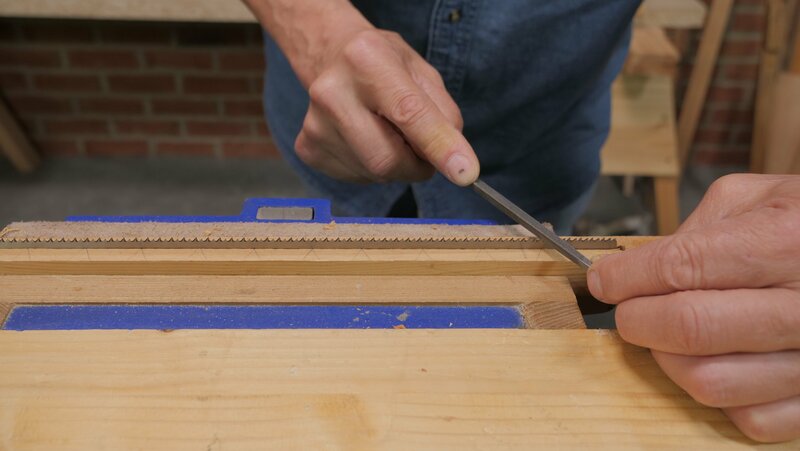 This applies to all saws except the coping saw which does not need sharpening as it comes with replacement blades, to see how to insert the blades, click here. Some saws will need setting before sharpening and some will need sharpening before setting. This all depends on the quality of the teeth to begin with. If your saw is secondhand and has well-worn, rounded teeth, you will need to sharpen these before it can be set. Sharpening will change the size of the tooth which determines how much it can be set. Some saws may only need setting, some may only need sharpening. To read more on saw files, visit our guide here. These are triangular so they can fit into the gap between the teeth. The width of each face on the triangle file should be double the height of the tooth that they are going to be used on. 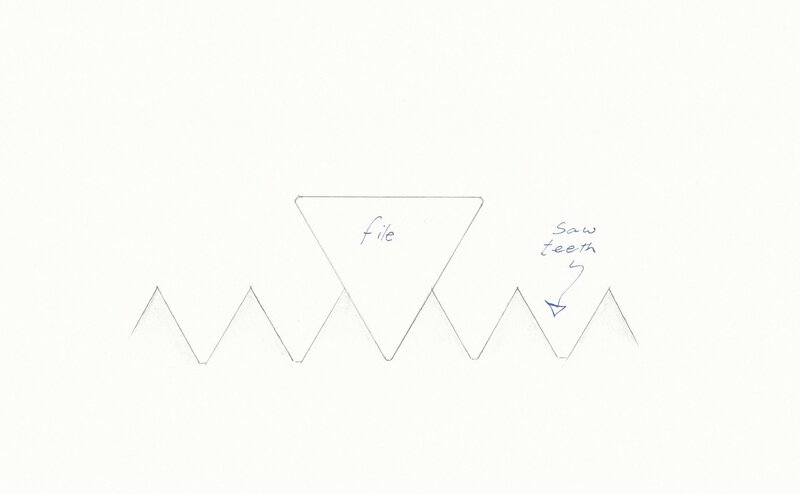 As the file sharpens two teeth at a time (the front of one and the back of another) it means that when the file is turned it will still have a fresh cutting surface. The saw file has 6 faces, it is important that the 3 smallest faces also have cutting teeth. If the are worn they can prevent the saw file from working altogether. For a ripcut pattern, every tooth is sharpened from the same side. For a crosscut pattern, every other tooth is sharpened from one side and the remaining teeth are sharpened from the other side. 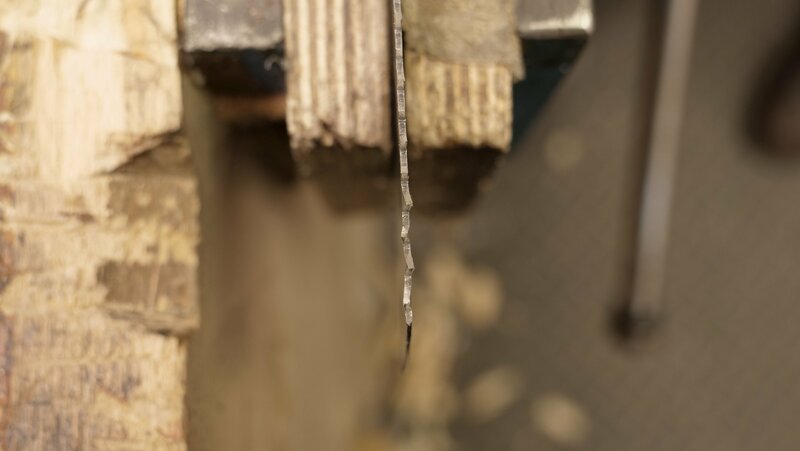 When sharpening a ripcut pattern, you will go in between the teeth at 90° across and with the file level, the front of each tooth is now filed at the most passive angle. 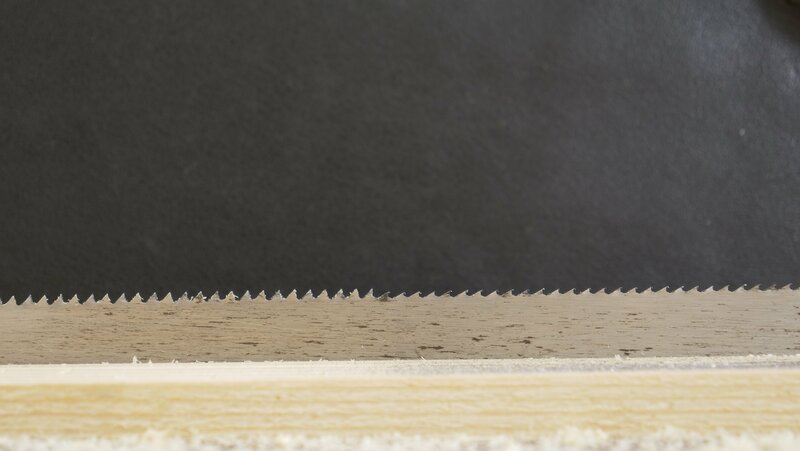 We recommend sharpening your saw to the most passive pitch, this will enable it to be able to cut both crosscut and ripcut. To vary the aggression of the pitch, roll the file forward, the steeper the pitch, the more aggressive the cut will be. 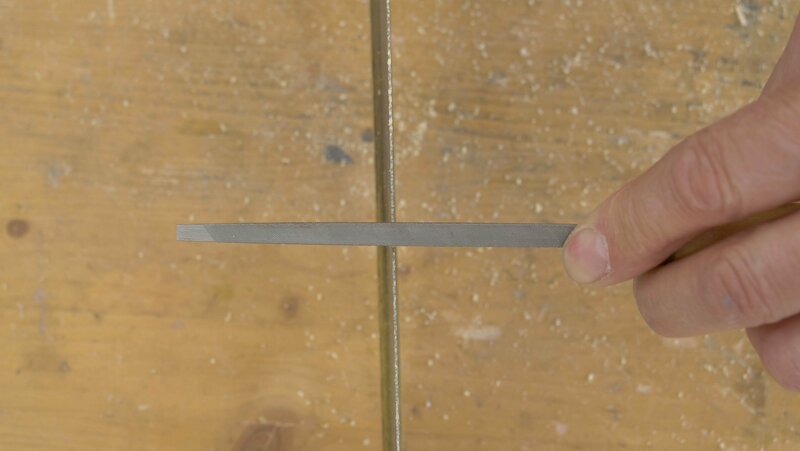 To help you sharpen your saw, you can make a holder to secure the blade in the vice, you can also draw guide lines on the holder to help you keep the file in line. The holder used to secure the saw in the vise. When sharpening a crosscut tooth pattern, the inside of each tooth is filed to create a pinnacle point. We do this by alternating the direction, sharpening each alternate tooth first from one side and then the other, this then develops a bevel to each side of the teeth we are sharpening. 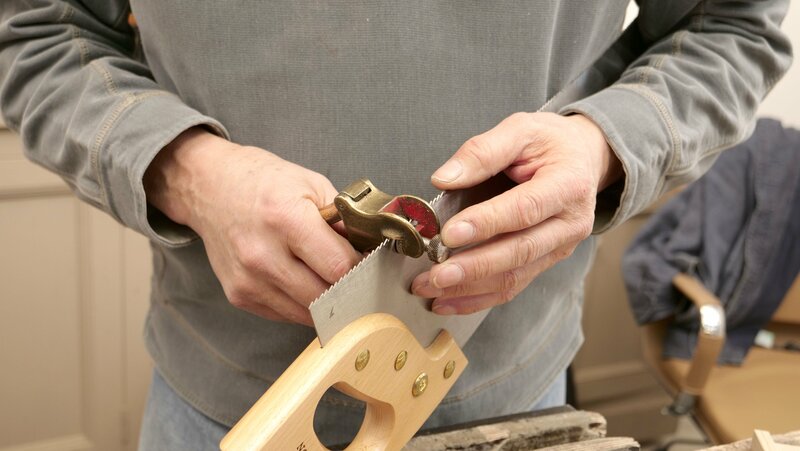 Tip: To see if a secondhand saw needs setting, test it on a scrap piece of wood. 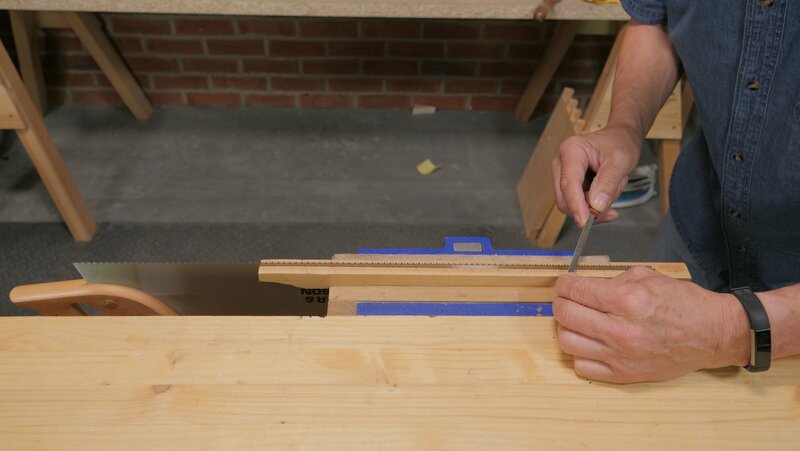 If the kerf is significantly wider than the plate itself, the set will usually need reducing. When setting up a saw, a device called a ‘sawset’ is used. This is essentially a mechanised punch which bends the tooth away from you. This is done on every other tooth, then the saw is turned around and the same is done on the other teeth to bend them the opposite way. You can adjust the depth of the set to determine how far you want the teeth to be bent. 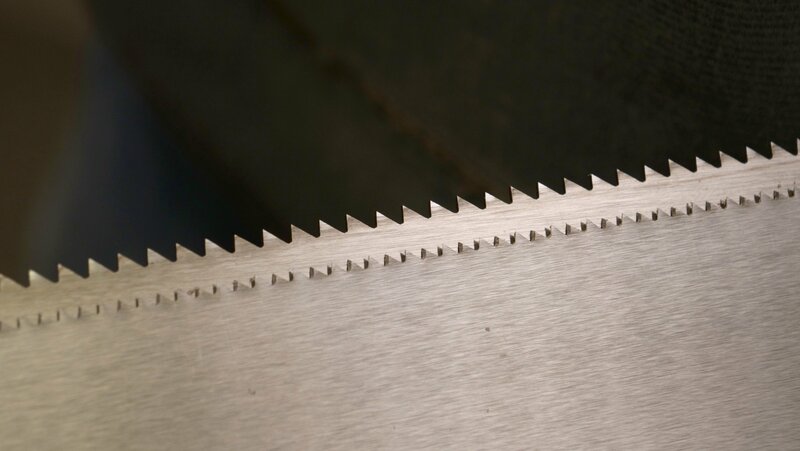 The teeth have to be slightly bent to allow the cut to be wider than the blade (Commonly referred to as the plate or saw plate), if the teeth were straight and inline with the plate then the side of the blade would rub against the wood and it would be very difficult to move the saw as it deepens in the cut. It is important that the teeth are evenly bent otherwise you would get a curved cut and struggle to saw straight or square. Showing the kerf on a saw plate. The teeth are bent alternately left and right to avoid the plate getting jammed. If you buy your saw secondhand, it is wise to check the teeth and see if they need setting. 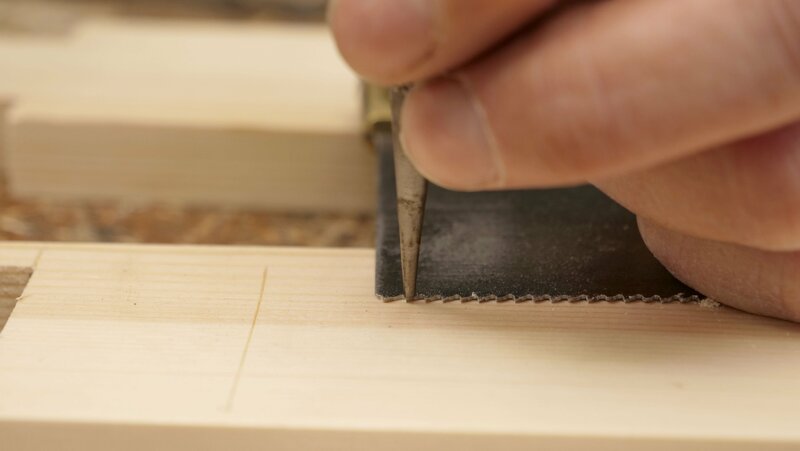 If you buy your saw new then it will often be set ready to go, although sometimes they may have too much set resulting in an overly wide ‘kerf’ which is the width of the cut. 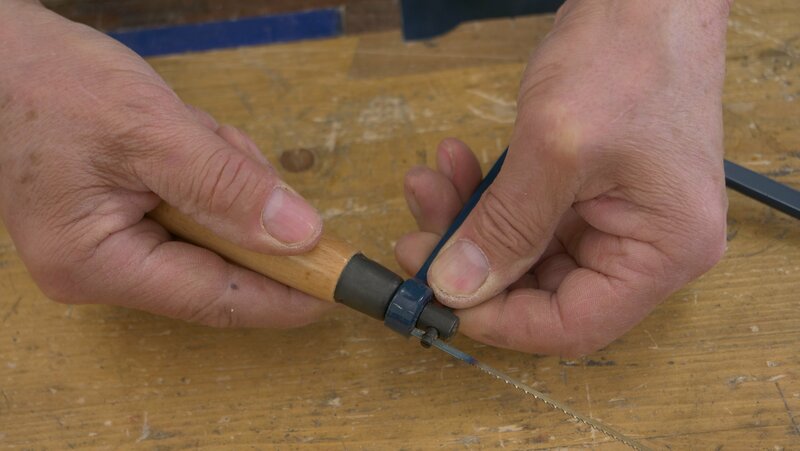 Sometimes the teeth will be too small or the blade will be too thin to use the sawset, in this instance it is best to use a nail punch and a small hammer with a light tap, you can watch Paul’s video on it here. 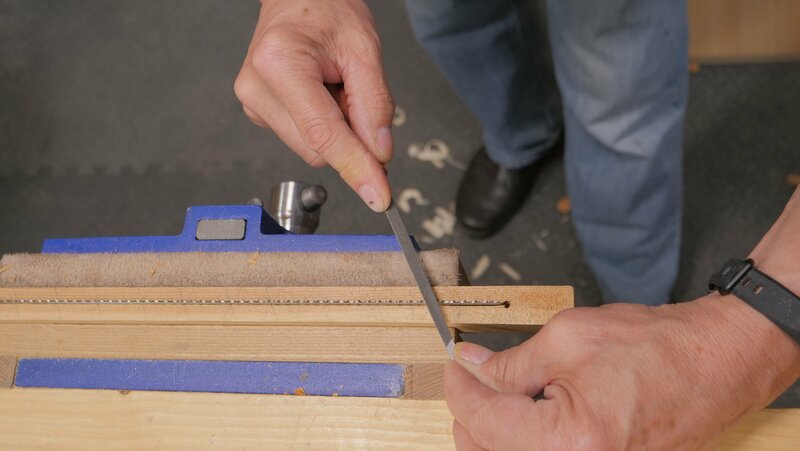 You use the same alternating process as you would with the sawset, but the saw plate is placed flat on a piece of wood. 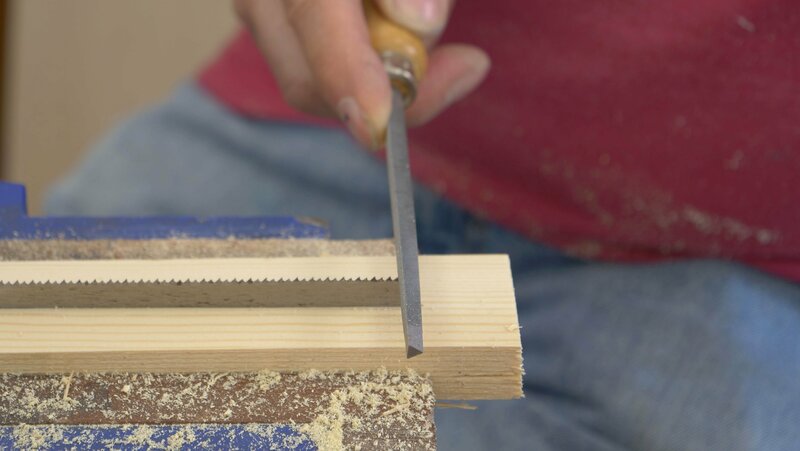 If you do not have a saw set, the teeth are too small or the plate is too thin, a punch can be used with a hammer instead. 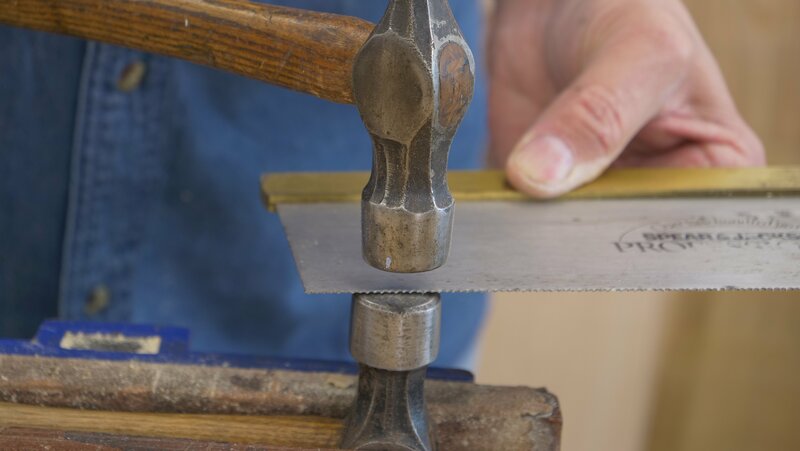 Once set, you then put another hammer in the vice, place the saw horizontally on top with the teeth centered on the face of the hammer and start lightly tapping all the way along the teeth using a second hammer. This is also how you remove excess set from saws that have too much. When changing the blade, loosen it by turning the handle anticlockwise while holding the lever on the inside of the frame in place to avoid the blade twisting. 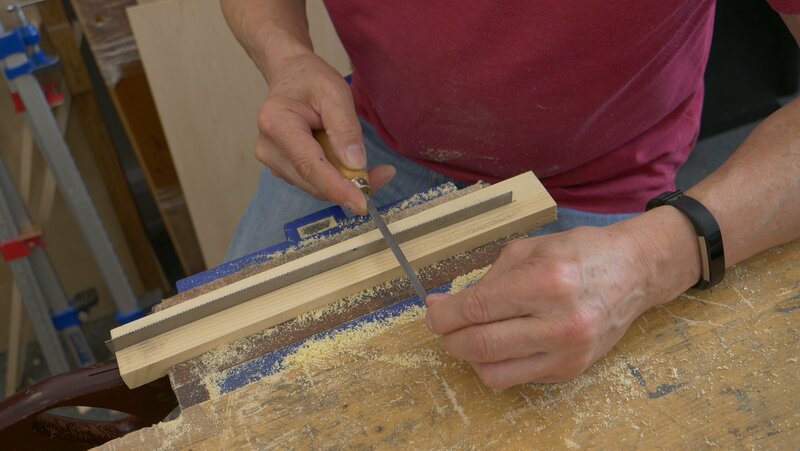 Keep turning the handle until the blade is loose enough to pull the levers in towards the centre of the frame and release the blade through the slots. 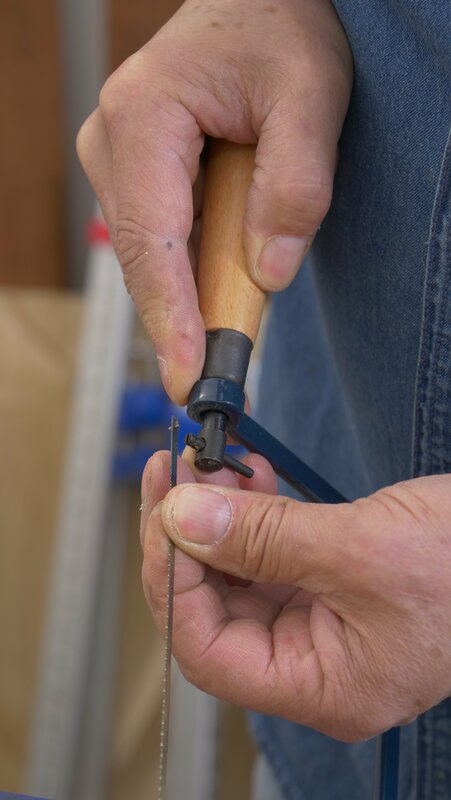 Once a new blade is in place, tighten the handle until the levers are held firmly by the tension. Both these levers need to be facing the same way for the blade to cut, otherwise the blade will be twisted. 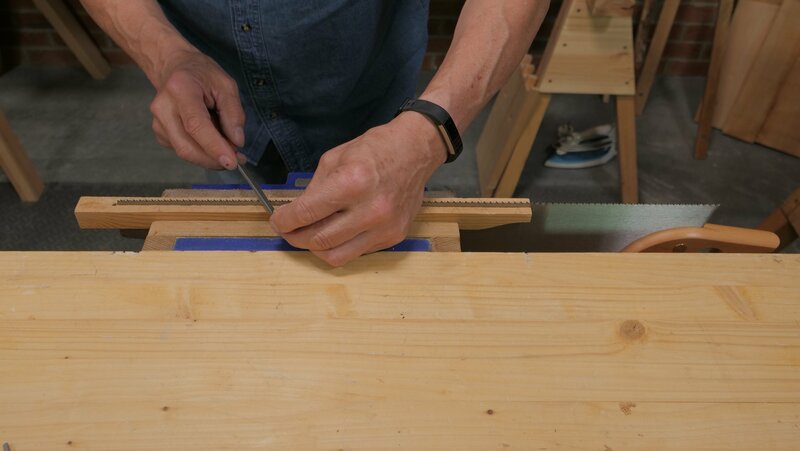 To change the direction of cut, loosen the handle slightly and turn both the levers until the blade is facing the desired direction then tighten the handle to keep in place.